Valve has rolled out an all-new interface for the Steam store homepage today, with an emphasis on making it easier to discover content you'll enjoy. The new design, codenamed the "Discovery Update 2.0", only modifies the homepage but introduces a number of handy additions. The most obvious change is the cleaner visual style and interface with a large, scrolling carousel at the top. 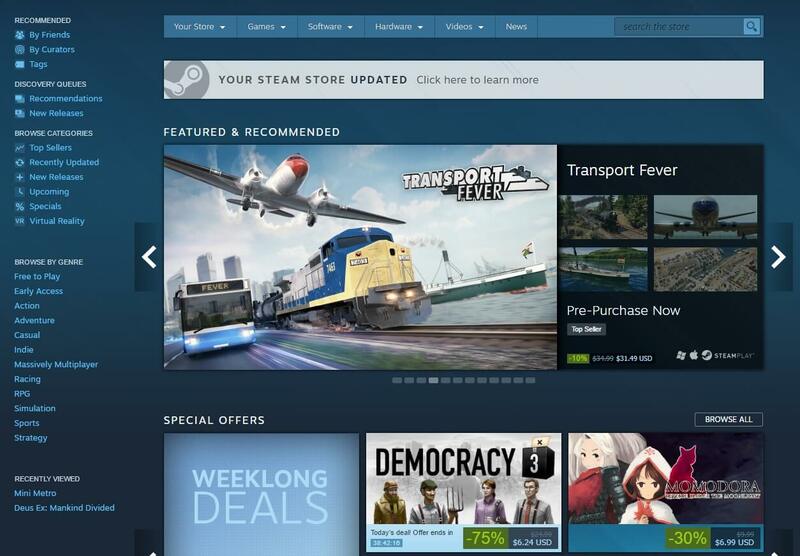 The entire storefront feels more modern, and places the most important features of Steam front and center. Deals and discounts, for example, now occupy a much larger space directly below the featured games section. Quick access links are found on the left side, and include easy ways to view top sellers, VR-only games, recommendations and more. Scrolling down the page reveals activity from your friends, a large section from curators, and a sliding panel for games in your collection or wishlist that have been updated. While this is a significant update for Steam's homepage, Valve hasn't updated any other area of the interface. Store pages for games remain the same, and the actual Steam application is unchanged (the Steam app just loads the Steam store webpage). You can access the new Steam interface right now via the app, or the Steam website.